Shell-shocked investors have lost patience with the traditional buy-and-hold approach to investing. 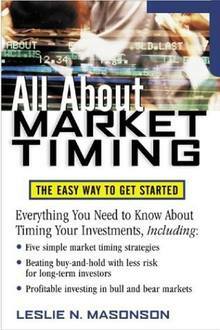 All About Market Timing arms investors with simple, easy-to-use timing techniques that they can use to enter rising markets, exit (or go short) falling markets, and make consistent profits in both market environments while protecting against catastrophic losses. Compelling arguments demonstrate the superiority of basic timing over buy-and-hold, while step-by-step instructions show how uncomplicated timing can be. Specific investment vehicles are recommended that fit well into most timing strategies. Investors who want to time the market using their own strategies are provided with information on available software and Web sites. And those investors who are looking for advisors to help them are provided with unbiased rating services to help them select the advisor that is best for them.